I had a VHS of Dr. Seuss on the Loose (a TV special consisting of three Seuss short stories) as a kid, and this special was included afterwards as a bonus feature. 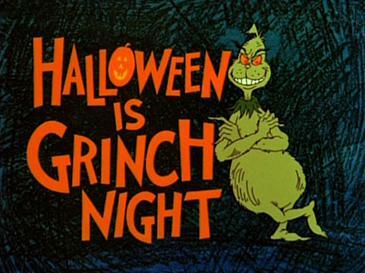 I actually saw this one before the Christmas one, and I grew up thinking that this was the original Grinch story, and that the Christmas one was a sequel (though since this is a prequel, it's an honest mistake to make). This is still a great movie that I go back to every Halloween, and has one of my favorite acid sequences ever. I'm not even going to spoil it. Try to find a copy somewhere and give it a watch. Though not as good as the Christmas one, it is a fun movie. I vaguely remember seeing this somewhere when I was very young. Is it a prequel? Yes. It takes place when the Grinch is still evil. I seem to remember Max leaving the Grinch at the end though. I've only seen it once and I was really young so maybe I'm remembering incorrectly. 2. It's a sequel, and the Grinch became evil again. Obviously, the Grinch becoming evil again seems a bit ridiculous, so this is most likely a prequel. I don't find it too much of a stretch that the Grinch managed to kidnap Max again between the two movies (after all, he does say he'll attempt to terrorize the Who's again someday at the end of this one). Some have also speculated that maybe the Grinch got another dog and also named it Max, since Max seems to be an entirely different dog in the Christmas one.